Board our vintage train for a beautiful autumn ride through the scenic forests of Shelby County. Lots of fun awaits at the Pumpkin Patch as you take a hayride, bounce in the inflatable bounce house, get lost in the corn maze, and participate in other family activities! Search our pumpkin patch to find your perfect pumpkin! Upgrade to a caboose ticket or locomotive ticket for a memorable experience and get an up close look at railroad operations! Snacks and drinks are available for purchase at the Gift Shop and at the Pumpkin Patch for cash only. Pumpkins can be purchased when you purchase your tickets online, the Calera Depot ticket window when you pick up your tickets, or on location at the Pumpkin Patch for cash only. 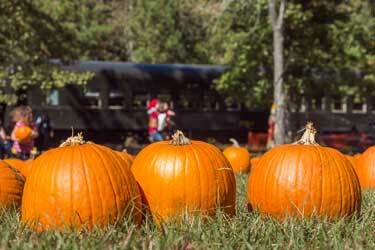 The Pumpkin Patch Express train ride lasts approximately 1 ½ hours including train ride and time at the Pumpkin Patch. Please arrive 1 hour prior to your departure time to pick up your tickets at the Calera Depot, use the restrooms at the Gift Shop, and to get in line at your boarding location. Make sure to visit the exhibits in our Depot Museum, our collection of railroad equipment in Clark Yard, our working Signal Garden, and our Gift Shop! Note: Above prices include taxes but not convenience fee. $3.00/ticket purchased on web or $4.00/ticket if purchased through the ticket call center at 205-757-8383 . Children 0-24 months ride free of charge though required to sit in an adult’s lap at all times. When ordering your tickets, select "Coach Infant" for no additional charge. If you did not order an infant ticket with your initial order, notify the ticket agent upon your arrival at the Calera Depot that you have a child 0-24 months that will sit in your lap, and you will receive an infant ticket. For your safety, strollers and infant car seat carriers are not permitted aboard the train. Our train has wheelchair accessible accommodations on the Long Island 2972 and Open Air Car 1121. Wheelchair loading and unloading occurs at the Calera Depot with a MobiLift wheelchair lift. We do not have wheelchair boarding capabilities at stops such as Ozan Winery, Cottontail’s Meadow for the Cottontail Express, or the Pumpkin Patch for the Pumpkin Patch Express. Note: A person in your party must be in a wheelchair to purchase this ticket. This is only a space for a wheelchair, no seat is provided. Click here for more accessibility information. Snacks and drinks are available for purchase at our Gift Shop and at the Meadow. Purchases at the Meadow are for cash only. The Heart of Dixie Railroad Museum's policy is that no food or drinks be brought on the train. Please finish your refreshments before boarding the train at the depot. This policy also applies to any intermediate train stops where food or drinks may be sold. There are no working restrooms on our vintage railcars. Please use the restroom at the Gift Shop prior to boarding.